We have been so happy with this furniture set! We are now on our second season with it and it has held up great! Gather friends and family and enjoy your cozy firepit, relaxing poolside, or spacious patio with this Trey 12-piece patio furniture set by Corvus. 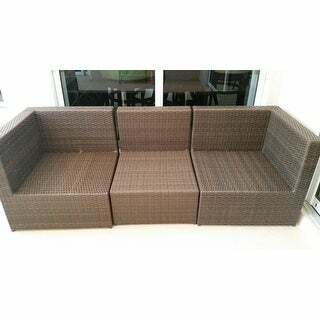 With durable powder-coated aluminum frame and dark brown handwoven resin wicker, the outdoor sofa set is weather and UV-resistant for lasting sturdiness. The beige cushions add style and plush seating, creating a comfortable place to relax. You can arrange the 12 pieces in a variety of accommodating configurations for outdoor events. The pieces for this furniture don't line up at all! !! The price is great, especially for all of the pieces included. Tons of options in regards to set up. 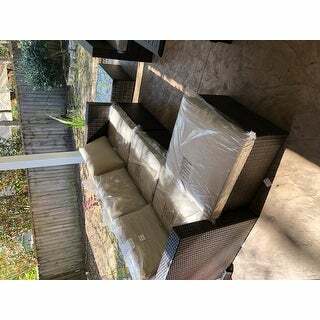 Cushions and framework are both good quality. The set looks really nice, especially with the throw pillows I purchased. The drawbacks are the height of the cushions as well as the depth of the seating. The seating is not deep and when you sit down your back hits the framework because the cushions do not come up high enough causing any prolonged sitting to become uncomfortable. Instead of slouching I have purchased throw pillows, but again because the seating isn't deep there's not a lot of room for additional pillows. Bottom line- if you are price conscious then this is a GREAT set. Quality is good and looks amazing, just be ready to make adjustments when using. If that's a deal breaker then be ready to spend a lot more money. The set itself looks nice, the quality seems good and I like the modular units which can be set up in a variety of ways (2-seater couch, 2-seater love seat, lounge, chair, etc.). I am, however, a short 5'4 and the seat is not deep enough for me. It is definitely not deep enough for someone with longer legs. Wish I had purchased from a place where I could have tried out the furniture first. I was looking for a large economical set . This one is nice. I would agree that the cushions are a little bit thin and light. I ordered an extra armless chair for the loveseat because the 2 piece loveseat was too small. It is somewhat of a low-profile set, meaning the top of the back cushions are not that high above the ground, but I like that. The cushions are really cheap. We were not sure of the quality we would get for the price but we could not be happier with this set and what we paid. The cushions are supportive on the bottom, which I was hoping for. The cushions in the back are much softer. I like them, my husband wishes they were a bit taller, but he is tall and just uses as throw pillow we added for color. 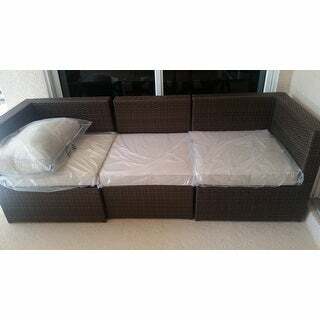 The cushions are also removable to wash, if needed. You can configure the chair in any way you want and it all clips together. The base chairs are made very well and sturdy. We are practically living in our screened in porch since we got this set. Perfect for entertaining or a quiet peaceful day. We definitely recommend this set. You get what you pay for. You get a lot of furniture for the price but it’s not particularly high quality. It’s rather light weight and the cushions are difficult to remove from the covers to clean. I’ve had this set for about 2 years. It still looks ok but I will probably upgrade soon. Glass top for the table was shattered upon delivery but customer service sent a new piece after I took a picture of the broken glass and sent it to them. This was a fantastic buy especially for the price! I received the furniture set which was easy to put together. All the pieces matched up perfectly. The furniture is very durable since I've had my football buddies sit on it whenever I bbq. I would suggest bringing in the cushions when you're not using the set since the cushions are not weather resistant. However, you can spray some water repellant and it should work fine. 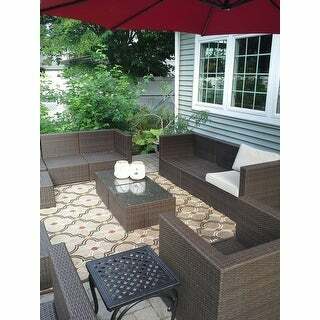 The set comes with so many pieces which is worth the money especially if you have a big yard/deck. We love our outdoor set. 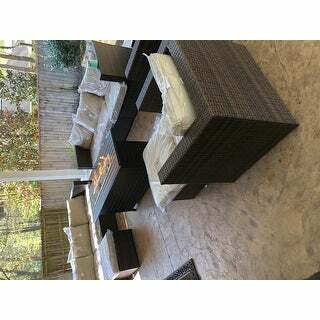 It's really hard to find outdoor furniture for a reasonable price without compromising quality, but we were very pleased. It was packed very compactly so it only came in four large boxes. Seats 10 people and is a great quality that I hope lasts for a long time. Would definitely recommend if you are considering something like this. 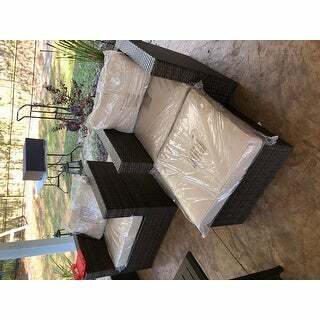 Both the furniture and the cushions are good quality especially for the price. Since it is sectional it is quite versatile, however, as mentioned by other reviewers it is a bit shallow. 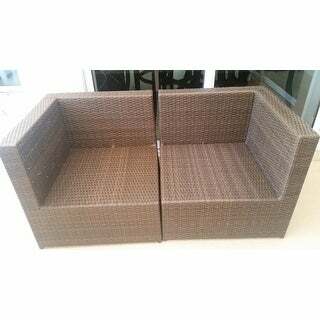 The cushions are also low for the height of the chair and the top corner is uncomfortable to sit against. I will definitely purchase throw pillows. Beautiful set.....but not made for tall people....sits extremely low!!!! This is a nice, large, attactive set that we used to fill up our roof top deck. It looks very nice and the many pieces were a bonus. Delivery was fantastic. It is not very comfortable though, unless you are slouching way down. The back only comes slightly more than half way up your back, and I am 5'6". I would hold a tape measure up to get an idea of the height of the back before buying, so you know what you are getting into. I will not return, too much trouble, and it serves it's purpose for the price. Just had no idea the back would be that low. Nice looking, not super comfortable. The set looks great on our patio. The backs don't come up very high, so they are a bit uncomfortable. You can rectify that by turning the cushions long ways and then it helps some with support. They have gotten wet quite a bit so far and they are very quick to dry. No Mold or mildew. I made one section with 4 pieces to lay down and that is comfy. It's more like 3.5 stars, but that wasn't an option. Great product once it finally made it to me. The estimated time frame was 1-4 weeks. I was thinking, there is no way it will actually take that long. Unfortunately I was wrong and it actually took 6 weeks to be delivered. I ordered the item on February 11 and it did not even leave the warehouse until March 4. It still took a few weeks after leaving the warehouse. The items were packed nicely. I was concerned I did not receive all of my items because there were so few boxes. To my surprise, they were all there and it great shape. The cushions are a bit hard but nothing unbearable. Overall I am pleased with the item. The pricing is good but The time it took to arrive was a bit excessive. This is a tremendous value. We have had this for almost two years and it is holding up very well. It is a little on the short side, wish it was a little bigger, but for the value it made a good purchase for us. Arrived very well packaged! Be aware this furniture is very small. Be sure to take out your tape rule and make certain it's what you expect, esp the height. That having been said, its exactly what I wanted for a small lanai. Not the best quality but considering the price I can't complain. I would have given it 5 stars (balancing cost and value) except the seat cushions provide very little padding. They're so cheap they're actually uncomfortable after a few minutes. We usually double them but they're still not right. Feels like the filling is wrong for the application, no internal support. I looked into changing them but cheap replacements at a big box store are approx *** ea and would add up quickly. For that amt of *** could have bought a better set in the first place. On the plus side, it's light, easy to assemble and move around. Again, would have been 5 stars if the seat cushions were better. This set is an amazing value and is so lightweight and comfortable I'm constantly moving it around based on the season and the demand. The cushion covers are very easy to remove and I just wash them in cold water - put them in the dryer on low heat for a few minutes and slip them back on slightly damp. They keep their shape well and always look like their brand new. The set was not only an incredible value, but looks great. We find it to be fairly comfortable. The fabric is not stain resistant so I recommend Scotch guarding the covers if they will be exposed to pets, kids, etc. It was basically ready out of the boxes. Very happy with this purchase. I thought I'd give a review after a season of use. This is very much worth the money. The ability to arrange in any order, at any time is awesome...One person can do all set up and storage. Easy clean up with the exception of cushions. The cushions take some time if become dirty. Clips come with set for easy connection without moving. Slip guards for every cushion. Kid friendly. Overall a decent purchase. Very versatile but wish cushions were a little more comfy and back was higher. "Are the tables storage tables? " No these are not storage tables. "is there any assembly involved with this set?" No, this is completely assembled. "Does this set have sunbrella cushion fabric"
"Do you have any cheaper patio furniture?" "Can I order only 3 piece sofa, 2 chairs, 2 tables? What would be discounted price and delivery time to zip 95120 ?" You may enjoy item #18059692. There are multiple sofa sets in Corvus Trey collection and you can see more details. "I need to order replacement cushions. Is there an item number for a replacement set?" Unfortunately, we do not currently carry replacement cushions for this item. Sorry we do not offer the replacement cushions on the site. But you can contact our customer service for further details. Thank you. "Do they come with covers? Or, may I purchase covers that will fit them (for winter storage)?" Mine did not unfortunately. Was going to buy some myself but none on **** seem to fit the cube-like structure of this set. They all have a higher back than the front. It would be really helpful for winter covers to be sold here on Overstock as an accessory to the set! If you find any please post your results. Sorry this sofa set does not come with covers. Please contact customer service. Thank you.